1. Given the choice between illegally scaling the royal castle’s walls to steal flowers for a client at his family’s dress shop or going on a date with a girl his brother set him up with (“He’s fertile, and he can sew!”), Tuck will scale the wall like a spider after a fly. 2. If, upon knocking himself unconscious when he falls off the wall, Tuck wakes up bruised, blindfolded, and inside the castle, where—based on the unearthly wails heard nightly—the prince no one has seen in ten years is probably a ghost, Tuck would still choose this over a date with a girl. 3. Tuck thinks it’s time to admit he’s gay. 1. He brought a curse upon himself and now bears the skin of a snake. 2. He can’t take his eyes off the injured thief recovering in the castle. 3. Friendships born from lying and insisting the other person wears a blindfold can blossom into true love—which he needs to break the curse. This is my first book by Ryan Loveless. I liked the blurb and was intrigued. I like fairy tales, and my favorite is Beauty and the Beast. When I read that the prince had been cursed, I knew that I had to read it. The book has aspects of my favorite fairy tale, but it is by no means a retelling of Beauty and the Beast. For one, only the prince is cursed instead of everybody that lives in the castle. 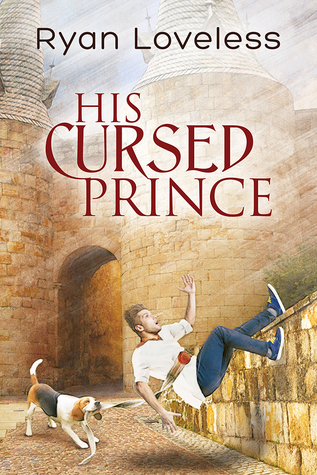 The prince finds out that to break the curse, he doesn’t have to find somebody to love him. As he realizes when he falls in love with Tuckington and Tuckington with him, and the curse still isn’t broken. I like that little twist on the curse. There was some weirdness on the world building in that there are some electronic advances, but other aspects of life are stuck in the past like using horse and carriage for travel and for delivering handwritten letters but also having cell phones, twitter, and dishwashers. I thought it was a little weird, but it’s a fairy tale, so I didn’t let it bother me too much. I mean look at all of the things that happened in Beauty and the Beast, so a little bit of weirdness is okay. I loved Tuckington Bell. He’s such a fun and loveable character. He loves to teach guitar lessons, but he’s also the best seamster and tailor at his family’s dress shop and is heavily relied upon by his family. When they have a particularly influential customer in the community order a prom dress for her niece, it puts his family into a tizzy to make sure that she’s completely satisfied. And to do that Tuck will end up having to illegally scale the royal castle’s walls to steal flowers for her dress. He ends up falling and knocking himself unconscious and wakes up bruised, blindfolded, and inside the castle where he meets George, who is the prince in disguise. Well, he doesn’t actually meet him because he has to cover his head by the covers, but he does get to talk to him, and in exchange for the flowers that he needs to finish the important dress, he agrees to come back to the castle and keep George company. George’s only stipulation is that Tuck has to be blindfolded in his company. As Tuck continues to come to the castle and visit with George, he finds himself falling in love with him and earning George’s trust. I also loved Prince Frederick George Deor, AKA George. He grows up with privileges being the prince and so is arrogant and self-centered. He ends up offending the wrong person and is cursed because of it when he’s sixteen. He pushes everybody away and lives at the castle with Lord Todd, his royal advisor, Sir Michael, his senior guard, and Gracie, his servant girl/cook. Sir Michael is more of a jack of all trades since everybody has left the castle, but he refused to leave the prince. Everybody else had moved with the king and queen to their other castle. The prince hates the way he looks with his snake-like skin and only goes out to visit the castle grounds when it’s dark, and there isn’t a chance that anybody will see him. As a result, there are rampant rumors in the community on whether he’s still alive or not. He isn’t happy to see somebody stealing his flowers. That is until he sees him fall and gets a closer look at the thief and can’t believe how handsome he is. As he learns to trust Tuck with his curse and how he looks, he’s changed by how accepting Tuck is and learns to accept the changes that the curse has made and decides to come out of seclusion and be part of the community again. With everybody’s acceptance of how he looks, he comes to love himself more and cares less about breaking the curse. And he ends up breaking the curse himself and getting the man that he loves. And they get to live happily ever after. It was a cute story, and I can’t wait to read more books by this author.